Plan it well, and you will see the benefits. Remember "Fail to plan, plan to fail"
This is the first step in the report called DO. 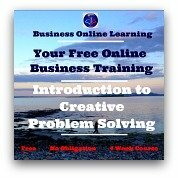 The aim is to complete a plan of action or a framework in which your problem-solving process will take place. 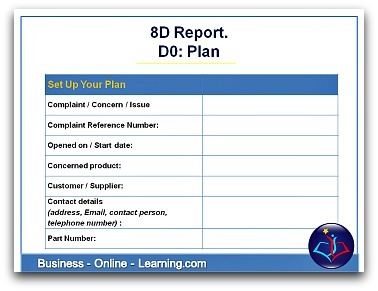 Your 8D Report plan is vital to a successful start to the whole process. Go through the following checklist to see that all that is possible is done to ensure that you have this successful start. As I always say "Start out as you mean to go on!" Have you sufficient knowledge of the 8D process or do you need more training? Have you all the details of the complaint? Is this complaint registered in the company management system for complaints and if yes, what is it's number? Have you the details on the problem at hand: part involved, specification number or part number, quantity, the supplier / the customer in question? What are the details of the contact person at the customer or supplier in question? This will be very necessary when it comes to getting the okay from the customer or supplier in question to changes that will be needed during the process. Will the team receive sufficient support from the management? Have management given you the mandate to carry out this 8D problem solving process? Have you prepared all the initial documents for the process, such as a copy of the 8D Report and any training materials needed? Have you all the specifications necessary, all test results, batch data, copies of customer agreements, etc. This is the first section of our form. The aim here is to document all necessary details you will need in your 8D plan. Having all the key data documented makes for easy reference for others involved in this 8D process. Noting the times of start and finish also helps later analysis of all 8d reports and their success as a method of problem-solving within your organisation. Below you will see a set of icons which will allow you to go through the different steps, the process steps and the part of the report that relates to that section. This template is downloadable from our Free Downloads and Resources page. In the following pages, we will be going through each section and each dimension of the 8d process.